2017 Cinema Diverse Festival Submissions are open. Cinema Diverse: The Palm Springs LGBTQ Film Festival Announces Festival Favorites; Director's Awards. FREE Tickets to Sin Verguenza. We have a limited number of FREE tickets available for both the Friday and Saturday screenings of SIN VERGUENZA. To take advantage of this offer and get your FREE tickets, you do need to reserve them. Cinema Diverse Line-up includes films by quite a collection of returning filmmakers. Cathedral City's Desert Cinema will become the valley's second theatre to screen films as part of Cinema Diverse: The Palm Springs LGBTQ Film Festival, marking another record year of growth for the niche film festival. We're happy to announce that the film, Like You Mean It, just came out on I-Tunes. If you missed this great film during the festival, or just want to see it again, now you can! 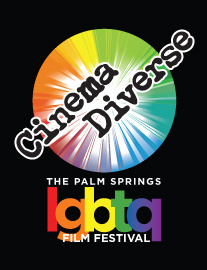 The Eighth annual edition of Cinema Diverse: The Palm Springs LGBTQ Film Festival called it a wrap on Sunday night, September 20th, 2015, with strong attendance, a record number of screenings, and a ‘diverse’ selection of audience favorites. Join Cinema Diverse: The Palm Springs LGBTQ Film Festival on Saturday, September 12 at 7:30pm (at Camelot Theatres, of course!) for a very special Advance Screening of the newly updated documentary, An Ordinary Couple. Cinema Diverse 2014 wrapped up its record breaking seventh edition in September of 2014, but the film festival referred to by one writer as "the Academy Awards of Gay Movies" is not slowing down any time soon. GLEEful Opening Planned for Cinema Diverse: The Palm Springs Gay and Lesbian Film Festival. Photos from Kaye Ballard Reception.